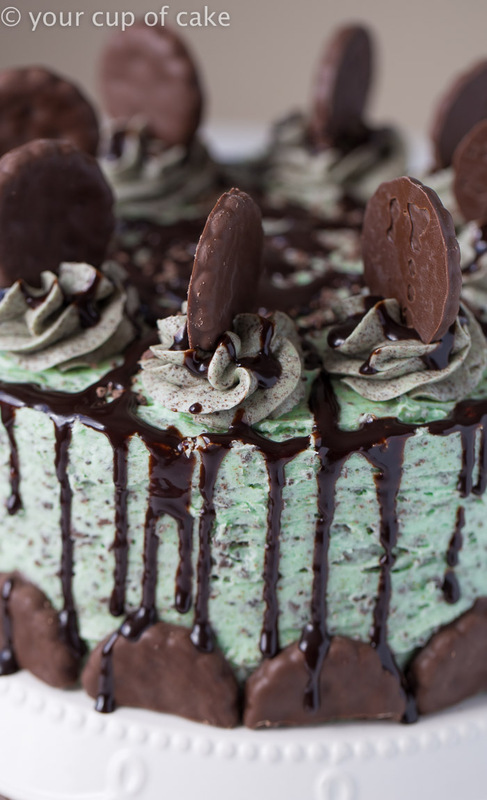 Chocolate Thin Mint Cake with crushed up cookies in the frosting, chocolate cake, and smothered in chocolate sauce. Could life get any better? Well maybe if it was zero calories, but don’t hold your breath for that! I’m not going to lie, I sort of messed up decorating this cake, I meant to put the chocolate drizzle on right after I did the base frosting but I forgot! Ah!!!! 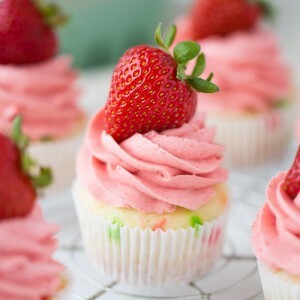 But oh well, it still looks pretty scrumptious I would say. I broke a bunch of the cookies in half to try and make a little scalloped border. 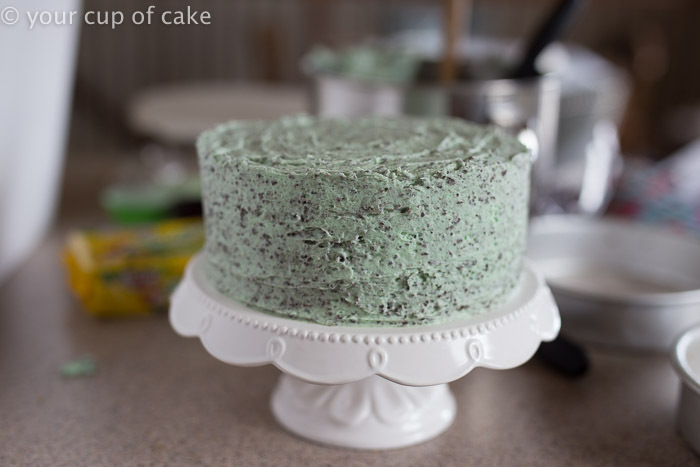 Decorating a cake at home can be so easy! I don’t use a rotating cake stand because I hate getting the cake from the rotating one to the pretty one. 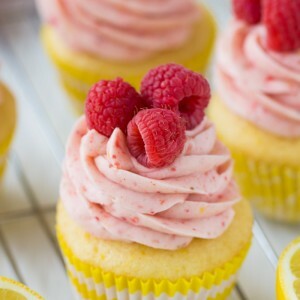 But the trick is to have plenty of frosting to work with! 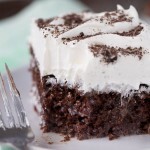 You want to make a sharp edge between the sides of the cake and the top! That’s what makes a bakery cake look professional! 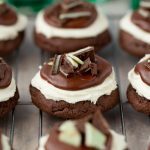 I pipe little dollops of frosting on my cakes but you can just drizzle with chocolate sauce and top with cookies! 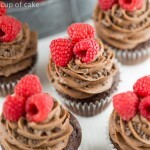 Everything looks better dripping in chocolate. 1. Preheat oven to 350 degrees and grease 2- 9 inch pans (or 8 inch pans are my fav). 2. Combine cake mix, eggs, butter, milk, sour cream and vanilla extract until smooth and then pour into pans and spread out evenly. 3. Bake for 17-22 minutes or until an inserted knife comes out clean. 5. 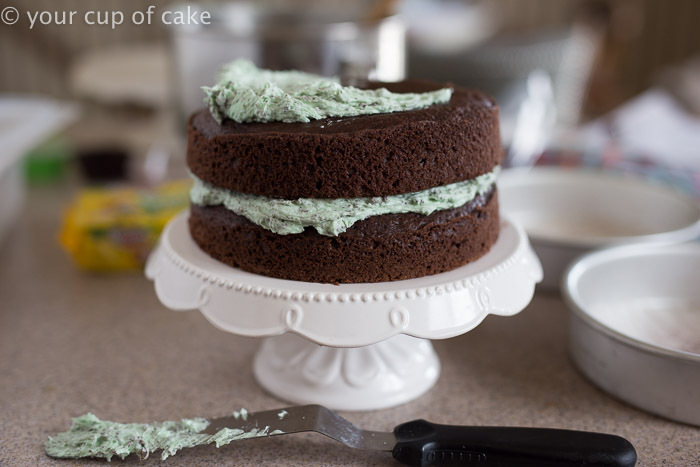 Thin Mint Frosting: Beat butter until smooth. Add vanilla, peppermint, milk, and 2 cups powdered sugar. Continue to add powdered sugar until you reach your desired consistency (you'll want it spreadable). Use food dye to get a green color and then stir in your crushed Thin Mints. 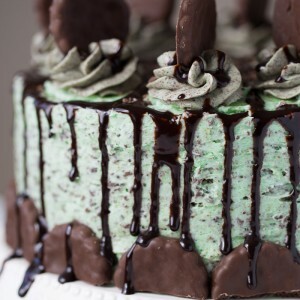 I made this cake for my daughter’s birthday and it was fabulous (though the not-as-rabid Thin Mint fans had to have it with vanilla bean ice cream). 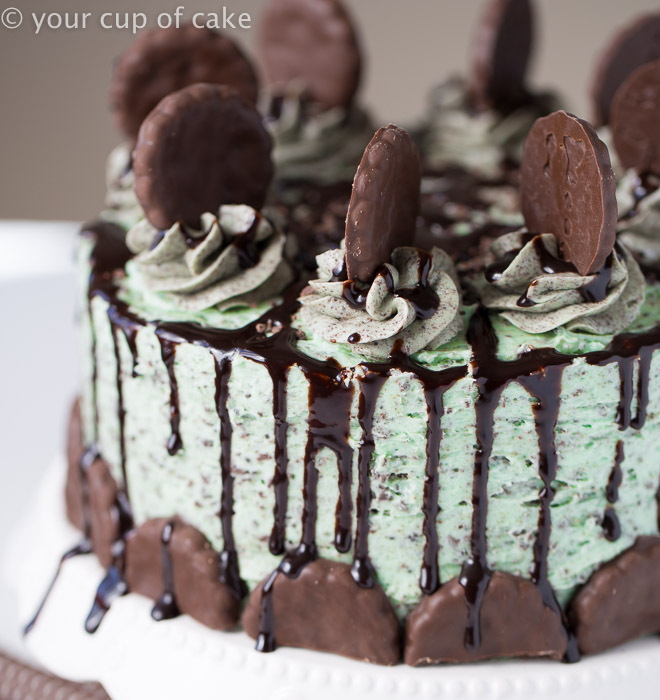 It went together easily and the Thin Mint frosting was SO forgiving while spreading. 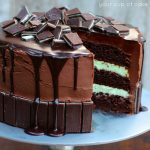 The only change I made was to add chocolate ganache between the cake layers. My daughter even loved the crazy drizzle, so I melted the remaining ganache and went to town on top! Thanks for a great recipe! Hi! 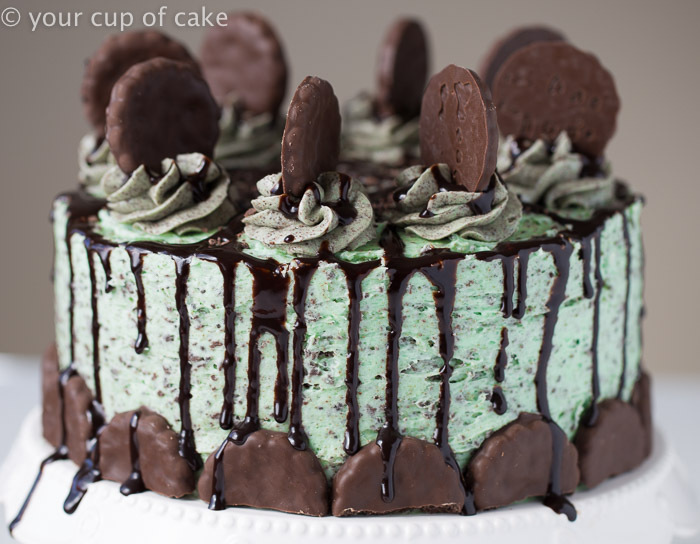 I’m looking forward to making this cake soon. 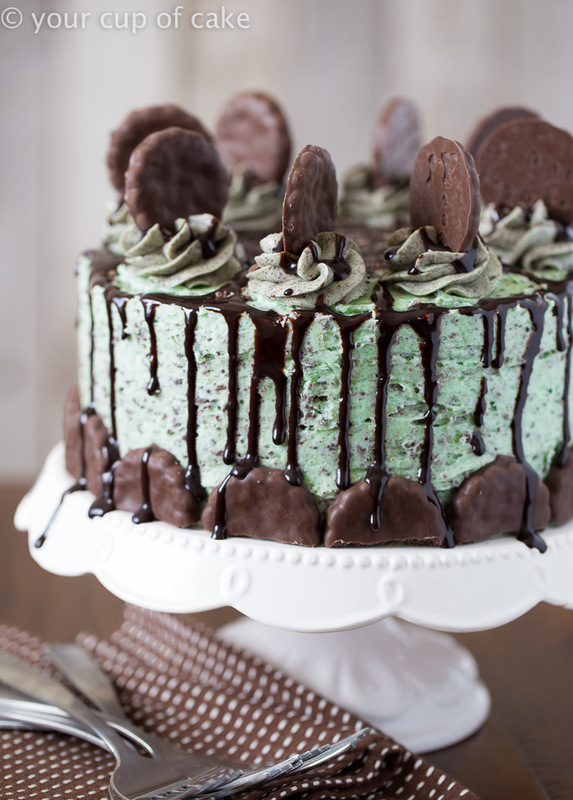 I had a question, it looks like you used the green frosting between the layers and all around but used another frosting on top to actually stick the thin mint cookies with. 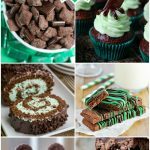 I was wondering which frosting recipe to follow for that one!! 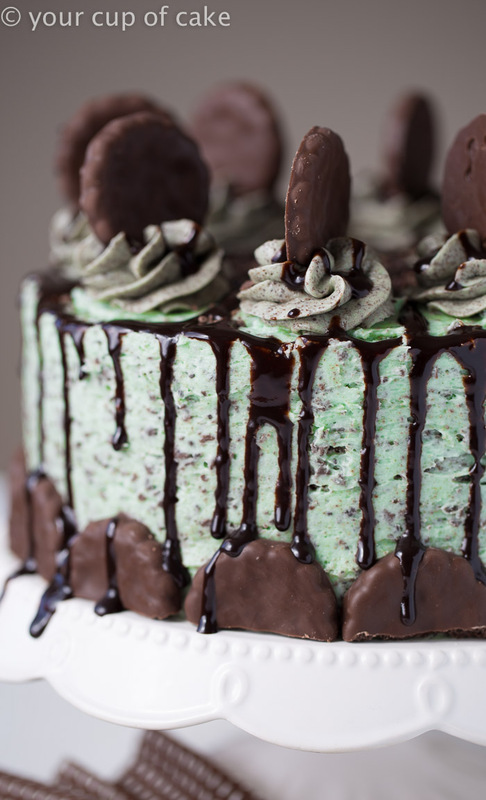 Not my recipe, but I would guess she just used the same frosting but without the green food coloring.